Sometimes lightning strikes with certain projects, and I feel like it really did with Murder-A-Go-Go’s. The collection is the brainchild of my friend Holly West, a talented writer and editor who not only came up with the concept, herded a bunch of crazy cats into write stories, and got Down & Out Books to back it… she also got Go-Go’s co-founder Jane Wiedlin to write the introduction to this collection (!). The day I found out my husband was dead, it broke my heart. But I collected enough of myself to drive into town and corner the sheriff for answers. The jail was around the corner from Main Street, a tidy rectangle of a building with a pair of Art Deco angels guarding the entrance. Back in the day, my little hometown had big dreams for itself; like my own, those had been crushed to dust. “Cassie! I was just heading over to see you,” the sheriff said when I walked in. That was an obvious lie. He was at his desk, with a spread from In-N-Out Burger laid in front of him. The sheriff nodded and wiped his face with a napkin. He was red-faced and bulky, with a nose that had been broken a few times. It was hard to say if his face flushed, because he was always overheated. “You have no idea how sorry I am,” he said. “Stop him?” I repeated, my voice flat. I swallowed my anger, aware I needed to stay calm. My father controlled everything in our tiny town, including the sheriff. If I was ever going to get to the truth about what had happened, it wouldn’t be by blowing up. Automatically, I glanced in the direction of the town’s single jail cell. It was pristine and empty. The acrid aroma of bleach hung in the air. “How on earth did Ray get a knife into his cell?” I asked. He looked down at his rapidly cooling burger and fries, and I wondered if some part of him felt bad about lying to me. He wasn’t an evil man, from what I knew, just an obedient one. 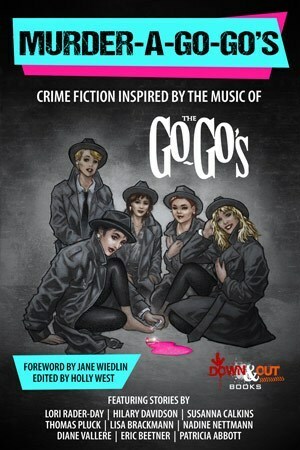 Murder-A-Go-Go’s includes stories by Lori Rader-Day, Susanna Calkins, SW Lauden, Jen Conley, Greg Herren, RD Sullivan, Steve Weddle, Lisa Alber, Eric Beetner, Craig Faustus Buck, Nadine Nettmann, Thomas Pluck, Diane Vallere, Bryon Quertermous, Patricia Abbott, Sarah M. Chen, Travis Richardson, Renee Asher Pickup, Josh Stallings, Dharma Kelleher, Stephen Buehler, Wendall Thomas, Jessica Ellis, and Lisa Brackmann. Want another reason to love this collection? The proceeds go to Planned Parenthood. Get this book now! This entry was posted on Tuesday, March 26th, 2019 at 8:54 am. You can follow any responses to this entry through the RSS 2.0 feed. You can leave a response, or trackback from your own site.